Online camp registration closes at noon the Friday before each individual camp begins. If you would like to sign up for a camp past the cutoff time, please call the Box Office at 408-961-5858 to register for the camp. Walk-ups are welcome ONLY on Monday morning based on the camp availability. A.M. Extended Care: 8am-9am; $50/week or $10/day drop-in. Available for full-day campers (9am-4pm) or morning half-day campers (9-12pm) only. P.M. Extended Care: 4pm-5pm; $50/week or $10/day drop-in. Available for full-day camps (9am-4pm) or afternoon half-day camps (1-4pm) only. For full-day camps, lunch is not provided. There is a break between morning and afternoon camps from 12pm-1pm; students who are attending both camps must bring a lunch and snacks, and will be supervised during the break by Montalvo camp staff. Students who are attending just a morning or afternoon camp should also bring a snack which they will eat during a short break. Full refund, less a $20 non-refundable fee, if request received in writing 60 days before the first day of camp; 75% refund, less a $20 non-refundable fee, if received in writing 30 days before the first day of camp; 50% refund, less a $20 non-refundable fee, if received in writing 15 days before the first day of camp. No refund if request received within 14 days of camp, or for early withdrawal. No refunds will be granted for early camp withdrawal, absences, or behavioral dismissals. In the event that Montalvo cancels a program, all fees will be refunded. At Montalvo we have zero tolerance for bullying. Bullying of any kind will result in the immediate removal from camp. The physical and emotional safety of our students and staff are central to Montalvo’s camps and vital to its overall mission. As such, we take the issues of bullying, harassment, and violence very seriously. Bullying is generally defi ned as when one or more people maliciously exclude, tease, taunt, gossip, hit, kick, or put down another. Montalvo’s leadership investigates any and all allegations of bullying, and trains camp supervisors to promote positive communication, so that students can feel comfortable voicing their concerns to staff. By working together as a team to identify and manage bullying, we can help ensure that everybody has a great experience here at Montalvo. If you would like to apply for a scholarship, please fill out our online Scholarship Request Form. 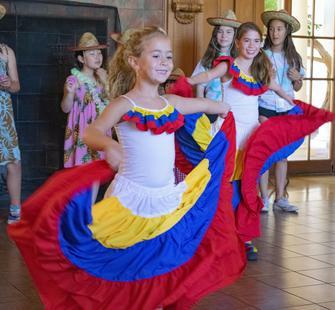 Five days filled with Latin drum rhythms, dancing, singing, and bilingual performance! Students will practice the fundamentals of the Spanish language in a uniquely engaging atmosphere. At the end of the week, they will share their developed language and musical skills in a performance for friends and family. For more information, call the Box Office at 408-961-5858 10am-4pm Monday-Friday.